The next thing to install is the fuel diaphragm. 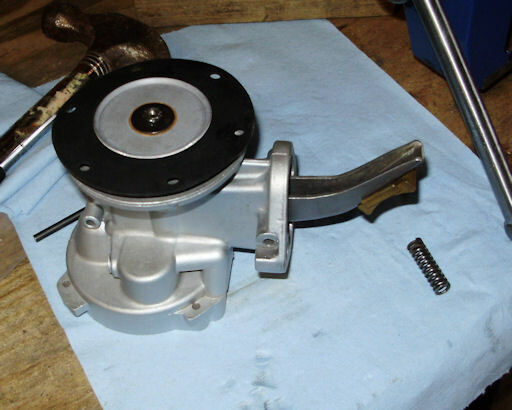 When assembled in the pump body, it will look like it is shown below. Lightly oil the rubber seal and install the diaphragm into the pump. 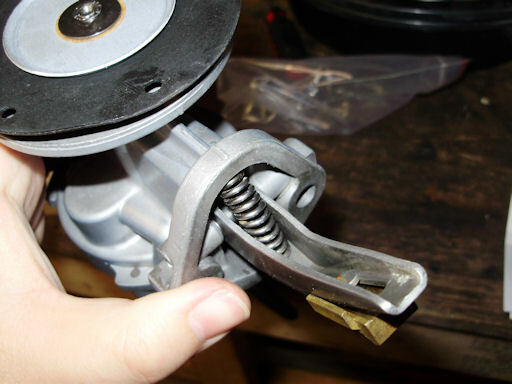 You will need to push down on the diaphragm until you can slide the pump arm onto the rod and drive the pivot pin back into place. Next, install the pump arm return spring. Make sure that it is over the nubs on the pump body and pump arm. 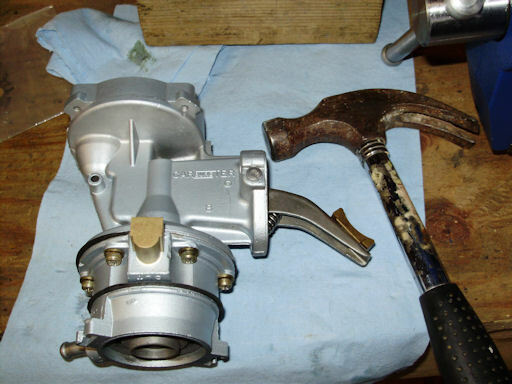 Next, put the pump body in a vice as shown below and slip an adjustable wrench over the end of the pump arm. 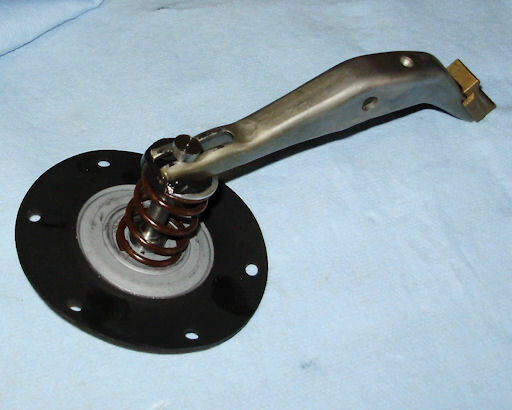 This will give you the leverage you need to compress the diaphragm spring enough to attach the pulsator assembly. You will also need to have six of the Philips head screws with a washer on them ready. To install the pulsator, turn the diaphragm so the screw holes line up with the screw holes in the pump (the screw hole pattern in the diaphragm is slightly larger than on the pump body on purpose), place the pulsator assembly on top of the diaphragm (make sure to line up the marks you made earlier) and pull up on the wrench to compress the spring as far as it will go. Install the screws and tighten them. Some of the screws will take a bit of wiggling to go in but you'll eventually get them. One tip for you when doing this is to make sure that each screw is in a few threads before you allow any tension to be placed on them. If you don't do this, you run the risk if stripping the threads out of the pump body. Note: Make very sure that all of the screws go through the holes in the diaphragm. See how the edge of the diaphragm sort of disappears in the next picture? I didn't catch that until I started the car. That mistake pumped a bunch of gas on the garage floor. Next, install the pivot pin plug. 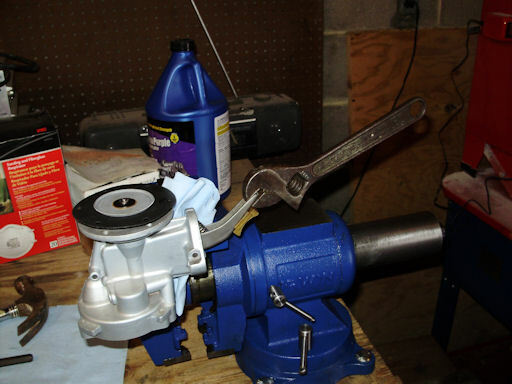 Tap it in until it is seated in the pump body and then give it a couple of sharp whacks with a pin punch in the center. This will cause the plug to expand so it doesn't fall out.